Nkorho Bush Camp is a luxury yet affordable wildlife option that provides unforgettable game viewing in the Sabi Sands Game Reserve adjoining Kruger National Park. Sabi Sands reserve has a diverse abundance of wildlife with 300 bird species and 200 animal species, including the Big Five -( lion, leopard, rhino, buffalo, elephant ). 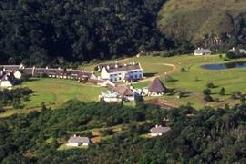 Nkorho Lodge has a relaxed atmosphere, comfortable accommodation and great food. You won�t find friendlier Rangers or better value for money game viewing anywhere in Africa. Set in a comfortable environment a true safari experience 'extraordinaire' whereupon guests become one with nature. As the days draws to a close, feel the thrill as the nocturnal animals rule the night. 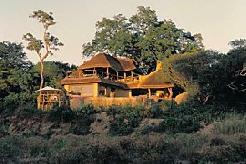 You are lured to indulge in typical African cuisine around an open fire in a traditional Leadwood boma. Stylish yet homely en-suite thatched chalets offer comfort with a difference. 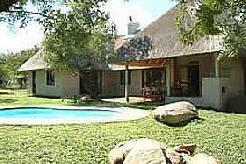 Accommodation is in 6 comfortable en-suite chalets each with mosquito nets and overhead fans. 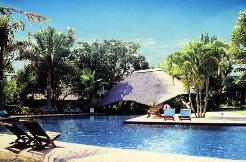 There is a lovely thatched lodge area for breakfast and lunch adjacent the swimming pool. 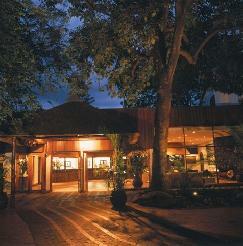 Dinner is usually eaten in the Boma under an African sky sparkling with stars. Days are filled with opportunities as your experienced ranger and tracker, take you out on a trail to experience the smell and excitement of the bushveld, as a fresh wildlife encounter unfolds before your eyes. Nkorho Lodge is situated in the 65,000 hectare Sabi Sands Reserve which shares a border with the unfenced Kruger National Park and has a reputation for frequent leopard and lion sightings. 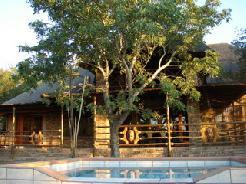 The Big Five are almost guaranteed if you spend two nights at Nkorho Lodge. 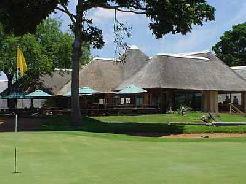 The golf courses are 2 hrs drive from Sabi Sands so you are best just taking time out to enjoy the wildlife experience and play golf before or after you visit to Nkorho.